It may be a long time before you reach retirement age but those spider veins on your legs and arms say otherwise. These unsightly, web-like veins can age you by adding years to your appearance. If you are concerned about the presence of spider veins on your legs, arms or face then laser therapy may be the solution for proper removal. Spider veins are tiny, dilated blood vessels that are found just beneath the skin’s surface. They form when too much stress is put on the vascular system causing the veins to bulge and enlarge. This is mostly due to poor circulation, mostly in the legs. Normally a shade of blue, red or purple, spider veins are usually found on legs, thighs or the calves. They can also be formed on the trunks of arms or the face. Do not panic if you spot these veins. While they are cosmetically unappealing, they do not require immediate medical attention. Who is Likely to Have Spider Veins? What was once considered to be synonymous with the elderly can affect anyone at any age. People, women especially, have been to know have spider veins as early as their 20s. Age and genetics both play a major role in the formation of spider veins. They are also likely to develop due to standing or sitting for extended periods of time. Individuals in the medical field or people with sedentary jobs at higher risk for forming spider veins. Other causes may include pregnancy, obesity, varicose veins, or those who use topical or oral steroids. People who do high-intensity training or strenuous workouts have been to known to develop spider veins as well. Spider veins are generally painless and are less likely to affect your health. However, consult with a physician to ensure there are no underlying health issues. Laser therapy is a less invasive medical treatment that does not require the use of needles or incisions. The procedure works by distributing laser light energy into the veins. The light pulses target the blood vessels within the vein causing it to dissolve and be reabsorbed back into the tissue. After just a few rounds of treatment, the veins will begin to disappear. Smaller veins have been known to disappear almost immediately. Over time the veins will fade and disappear. Our patients at Fountain of Youth have been known to see results in as little as six weeks. The side effects are minimal and usually include redness and itching. 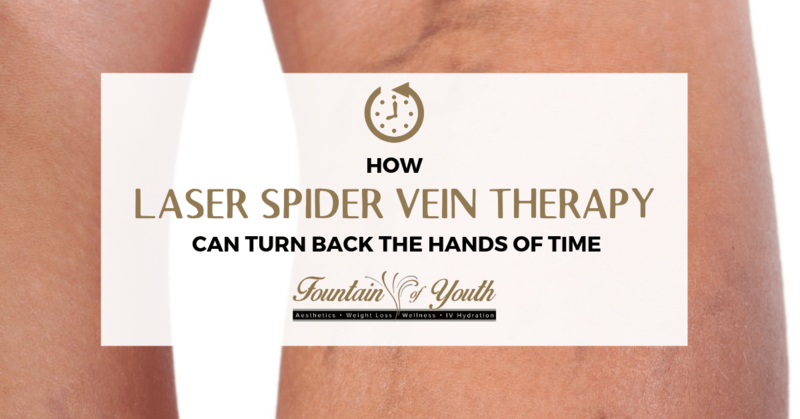 Laser spider vein therapy is a safe and effective procedure that will dramatically improve the appearance of your legs, arms and other areas of the body plagued by spider veins. Preserve your youthful presence with a visit to the Fountain of Youth. Leave those webs to the real spiders and schedule a consultation for laser therapy. Visit us at 6729 Spanish Fort Blvd. Ste BC in Spanish Fort, Alabama, call us at (251) 525-8446, or visit www.foywellness.com now!